Billionaire philanthropist and leading donor to liberal causes George Soros predicted Thursday that regulation and taxation will soon dethrone Facebook and Google, describing the tech industry’s major players as powerful monopolies that harm individuals, market innovation and democracy. 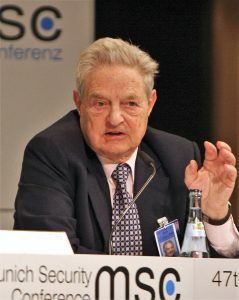 In a wide-ranging, scathing speech delivered at a dinner event at the World Economic Forum in Davos, Switzerland, Soros applauded the European Union’s heightened enforcement aimed at Web giants. He also called for greater regulation of the tech companies, seizing on a growing backlash against Silicon Valley. Facebook and Google have said they are open to greater government oversight in their ad operations. But Facebook has gone even further in recent weeks, publicly grappling with its role in global society. Last week Facebook even admitted in a blog post that social media can sometimes harm democracy. Soros suggested that American officials draw from their European counterparts, particularly EU Competition Commissioner Margrethe Vestager, whom he described as the “nemesis” of American tech monopolies. Vestager, a former Danish economy minister, and other EU officials have recently advanced a host of enforcement actions against prominent U.S. tech companies. So, George Soros wants governments to reign in internet firms and to control them more. George Soros used the spotlight of the World Economic Forum in Davos, Switzerland on Thursday to urge the international community to take seriously the threats posed by Facebook and Google, which he said could ultimately spawn “a web of totalitarian control” if they are not reined in. Back in 1949, when author George Orwell wrote nineteen eighty-four (1984), the technology for the type of governmental surveillance he wrote about did not exist. Irrespective of what one thinks of George Soros, the fact is that internet firms have worked with “authoritarian states” as well as states in Europe that the Bible shows will become more authoritarian. In many parts of the world, governments are collecting the massive amounts of data on their people like that which is alluded to in Orwell’s novel. With the rise of technology we have also seen the rise of governmental monitoring and censorship. In more and more ways now, that is possible. Sadly, increased governmental surveillance is supported by the Trump Administration in the USA (see Donald Trump’s presidency has been fulfilling many predictions). But I will also add that his Administration is mainly building on the what the Bush Administration started with the so-called Patriot Act, and the massively expanded surveillance under the Obama Administration. I warned against these back in 2012 (USA now in Orwellian society? ), 2013 (It’s not paranoia: The USA government is engaged in massive surveillance on its citizens and others; Germany applauds Snowden. 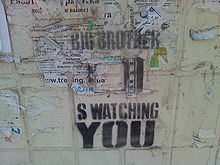 and Can ‘big brother’ watch you through your television? ), and each year since. While George Orwell did not write about private companies like Facebook, Google, Twitter, or YouTube, those companies clearly do not support the agenda or the morality of the Bible. These tech companies have repeatedly been involved in surveillance and censorship. The world is getting less tolerant of speech that does not conform to what governments find ‘acceptable’ or believes is ‘truth.’ Plus, it seems to place precious little value on the truth. It was not possible to monitor all buying and selling when George Orwell wrote his novel. But as many societies head towards cashlessness, that is becoming more possible. The use of the internet, cellular telephones, security cameras, and other ‘smart’ devices have given companies and governments the ability to monitor like never before. Sadly, the type of society that George Orwell wrote about is taking shape. Many realize it, but do not know what do to about it. But many can be called now (see What Did Christ Mean – Many Are Called, But Few Are Chosen?). Furthermore, there is good news as the Kingdom of God will come and replace the Orwellian (Revelation 13:16-18) system that we see being put together today. Here is a link to our video: Orwell’s 1984 by 2024? We are getting closer to a time that supposedly non-authoritarian governments will become more authoritarian and more controlling–it is happening already! George Soros’ comments will not prevent the end-time Babylonian beast from rising up and putting in place a totalitarian regime that will, for a time, dominate the world. Tech companies, mostly unintentionally, are helping to speed up the day this will happen. Is Evolution Probable or Impossible or Is God’s Existence Logical? Part II This short article clearly answers what ‘pseudo-scientists’ refuse to acknowledge. Here is a link to a YouTube video titled Is There Another View of Evolution? and another titled Quickly Disprove Evolution as the Origin of Life. This entry was posted on Sunday, January 28th, 2018 at 4:00 pm	and is filed under Prophecy. EU and Antifa have the same New World Order Orwellian goal?